Just a random post that was inspired by Emma Westport’s “Imperial Mistress” over at the Seduced by History blog here. These two cousins looked exactly alike. Their mothers were sisters, daughters of Christian IX of Denmark. Sometimes the families could not tell them apart when they were wearing each other’s uniforms, or in this case, Willy’s Prussian guard outfits. Storm clouds were gathering on the horizon when this photo was taken. And I don’t mean rain. 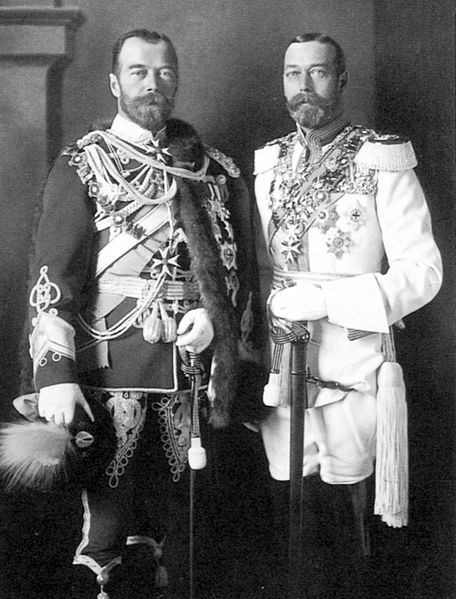 This entry was posted in Edwardian England, Uncategorized and tagged Christian IX of Denmark, George V, Tsar Nicholas II by Angelyn. Bookmark the permalink. Yes, Georgie, Nicky, and Willy (King, Tsar, Kaiser) stirred up lots of trouble and led the world to war despite the family connections!